Gemstones provide a staple element in many jewelry designs providing hundreds of different options for colour and sparkle that can add beauty and significance to the jewelry pieces you choose to wear. 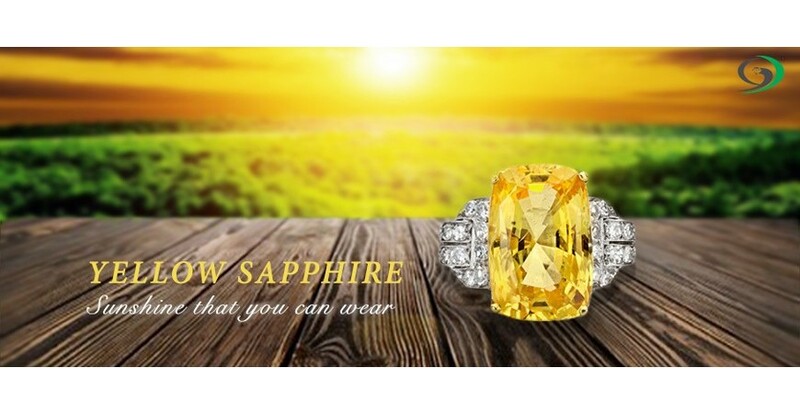 In particular, one of the most stunning and significant gemstones that you can wear is the yellow sapphire. Taking on a warm light sunshine yellow colour the yellow sapphire can brighten up jewelry pieces while adding a touch of warmth and colour to them unlike any other gemstone. Frequently, yellow sapphires provide a popular alternative to the diamond when designing wedding and engagement rings for women. Additionally, beyond possessing a look that is visually stunning what perhaps makes yellow sapphires the most significant is the cultural and symbolic relevance that these gemstones carry. Yellow sapphires have a special relevance within the Vedic astrology system, correlating, similar to other gemstones, with a specific astrological entity. Yellow sapphires are thought to be related to the astrological powers of Jupiter. Jupiter is thought to signify a number of different important and positive characteristics including wisdom, knowledge, power and good fortune. Astrologically, if Jupiter is believed to be in a good position within your birth chart, these benefits are thought to come more naturally to you and your life. However, for many of us Jupiter is unfortunately not located in a beneficial position during our births and as such many believe that wearing yellow sapphires can help to bring some of this good fortune and positive elements that are believed to be associated with this astrological entity into your life. Additionally, yellow sapphires are believed to bring prosperity and good fortune to your family and as a result, wearing yellow sapphires can serve as a good omen and symbol of good will. Gifting a yellow sapphire to someone expecting a child or planning to be married can serve as a symbolic offering of good fortune and a hope for fulfillment to the person you are bestowing the gemstone upon. Furthermore, yellow sapphires are believed to have a number of health benefits as well. Among the positive effects yellow sapphires are believed to possess, many over time have come to associate these gemstones with increased fertility, encouraging healthy and clear skin, promoting a balanced and stable mental state, and helping to treat respiratory ailments, rheumatism and improve poor blood circulation. Gemstones are an aspect of jewelry design that can help to define a piece and make it stand out. While gemstones of all shapes and colours can produce stunning visual effects, yellow sapphires possess a special and unique significance that makes them a particularly influential and enticing gemstone to consider when making your next jewelry purchase. Possessing a beautiful light yellow colouring, the yellow sapphire possess a special symbolic and cultural relevance that gives added meaning to those that wear it. Believed to promote good health, good fortune, wealth and prosperity, yellow sapphires may be the perfect addition to your jewellery collection or the ideal gift for the next loved one you are looking to bestow well wishes upon.